More than any other town on the Lower Rhine, Kalkar offers a unique mixture of architecture, art and urban buildings from the Middle Ages. The medieval atmosphere that exists within this living town will charm the discerning visitor. Calcaria nobile oppidium – Kalkar the noble town – was founded on the evening before the occasion of the “Eleven Thousand Virgins” (20th October 1230), by Count Dietrich of Kleve. The town, which was at this time only at the planning stage, received its town charter in 1242. The noble town of Kalkar would connect important trade routes leading deep into the Netherlands. The town on the Lower Rhine had significant sources of income from sheep breeding and wool weaving. In addition, the revenue from no less than 42 breweries, also filled municipal funds. Kalkar reached its full economical flowering in the 15th century. At this stage more than 4000 townspeople resided in over 500 houses. In 1540 Kalkar joins the Hanseatic League. Witness of this wealth is the planned and generous town layout, which still exists and is recognised as an international cultural monument. Old, stepped gable houses and the huge Gothic town hall, which dates back to 1446, line the market square. The town Hall, is acknowledged by experts, as the most beautiful at the Lower Rhine. The building itself counts as one of the most impressive secular buildings of the late Middle Ages. On a monumental scale and size, it exceeds all late Gothic town halls north of Cologne. The old court lime tree from 1545 still grows in the centre of the market square, which is paved with Rhine pebbles. Here, court was held in session, in a court porch. Advice for judgement was provided from the “Sachsenspiegel” (the first law book in the german language, written by Eicke von Repkow, in 1230). There is a copy of this, dating from 1430, in the town archives, and it is the most precious book in the collection. The museum, located in a merchant’s house circa 1500, still contains the original room arrangement: The hanging chamber “Hangkamer”, Hall “Halle” and the Inner Room, “Binnekamer”. The collection comprises paintings and sculptures of well-known artists of the nineteenth and twentieth century like Nauen, Radziwill, Clarenbach, Janssen and Teuber. Besides significant historical structures like the huge eight floor windmill at the Hanselaer gate (built in 1770, completely restored in 1996) or various buildings of the Gothic, Late Gothic, Baroque and Art Nouveau periods, the St. Nicolai church is without doubt, the jewel of the town Kalkar. The triple-nave parish church, with its 70-metre steeple, counts as one of the most significant art locations in the Rhineland. The church contains nine Gothic altars carved from oak as well as various sculptures and paintings from the Gothic period. Two artists worthy of a mention are Douvermann the Carver and Jan Joest, the painter of the high altar. The town covers an area of more than 90 square kilometres, and stretches about 15 kilometres along the banks of the Rhine River. Since 1969 thirteen formerly independent villages or municipalities from the modern town of Kalkar, which is rich with urban building and landscape beauty. As an example, Grieth on the Rhine River, a small former hanseatic town with charter from 1250, is now part of Kalkar. It was an old fishermen and boatmen town but today it is an attractive destination for day-trippers. It offers a Rhine River promenade and ferry for the numerous cyclists visiting the cycle paradise of the Lower Rhine. Every guest must determine his own main focus in Kalkar. To simply relax, perhaps take exercise or experience the many cultural attractions and the town’s medieval flair. 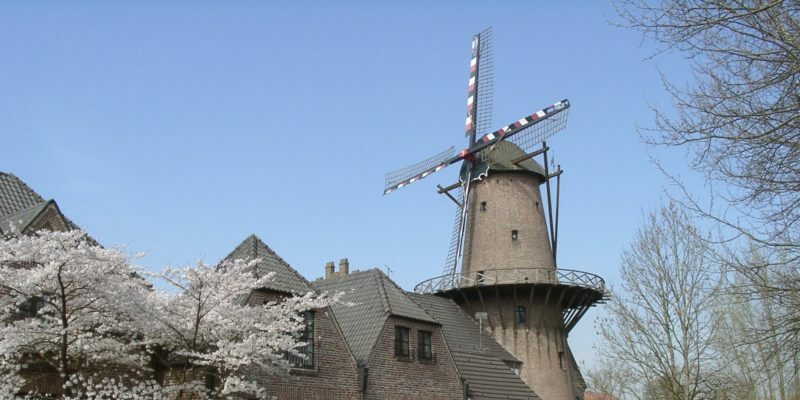 A visible combination of the past, the present and the future in Kalkar makes this town, so close to the Dutch border, an attractive holiday resort.